What if there was a way to make your wedding send off an event talked about for years to come? What if there were 25 ways? 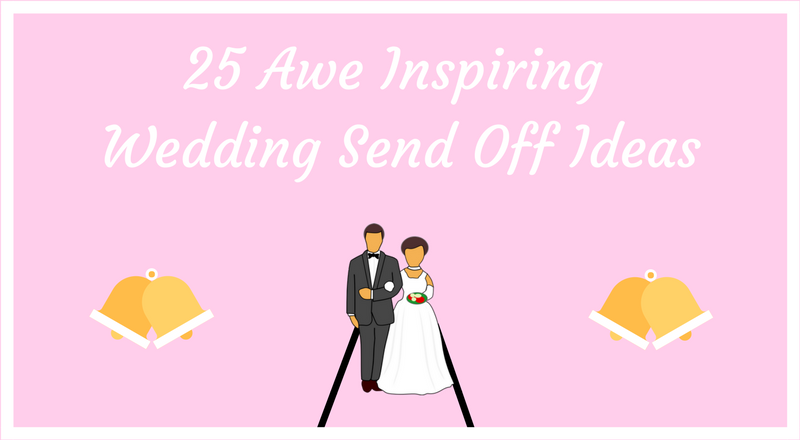 In this article, we’ll show you how to set up 25 wedding send off ideas that will leave your guests in awe and create AMAZING photos (spoiler: we’ve saved some of the best for last). Let’s get started on finding you the perfect wedding send off idea for your special day. - Why Do People Throw Rice At Weddings? - How Much Lavender Do You Need For A Wedding Toss? A quick note: keep in mind the ideal plan will vary depending on a variety of factors including your budget, the season, time of day, wedding theme, and restrictions at your venue. If you are like most of us, tossing rice at a newly married couple is probably what comes to mind when you picture a wedding send off. Ever wonder why we throw rice at weddings? The tradition has been a part of many cultures for centuries and dates back to the time of the ancient Romans. They were known to toss wheat at couples departing their wedding. It was a symbol of prosperity, fertility, and good fortune. Everything from wheat to corn, and even oats have been used throughout history for the ceremonial wedding toss. However, in the past century, the tradition of the wedding send off has expanded. Now all sorts of symbolic gestures meant to impart good luck and fortune on the newlyweds are present during wedding exits. This includes blowing bubbles, tossing rose petals, lighting sparklers, and even releasing butterflies into the path of the bride and groom. The reason for shifting away from rice? It was partially due to a false rumor that ingesting rice was harming (and killing!) birds by expanding in their stomachs. This myth has long been dispelled by science. However, rice or not, the tradition of marking the end of the wedding with a symbol of joy, luck, and prosperity has carried on! For those looking for a wedding rice alternative, here are 25! A grand wedding exit is one of the most memorable moments of any wedding. However, like it or not, when it comes to wedding planning, making decisions often comes down to what will work with your budget. If you are considering skipping the tradition to save money, we’ve got good news: A wedding send off doesn’t need to break the bank! In fact, there are tons of affordable wedding send off ideas that can work for even the smallest budget without looking cheap. Read on to learn more about some of our favorite cheap wedding send off ideas and some tips and tricks for pulling them off for a seamless exit. 1. Grab Some Leaves To Toss, They’re Free! If you are planning a fall wedding, why not embrace the season and save money by using leaves for your wedding send off? In addition to being completely free, leaves will also make a beautiful, seasonal backdrop for your wedding exit and will look amazing in pictures. If you decide on this option, gather leaves from your yard or a public park, focusing on leaves that are in bright colors. You can then display the leaves in rustic baskets or wooden boxes for guests to grab. Want a more rustic touch? Wrap the leaves up in brown paper cones! You could also create individual baggies for guests to grab as they head to the send off locations. Another fun idea is to make confetti out of the leaves. We consider leaves to be one of the best confetti alternatives as it’s both free and environmentally-friendly! If you want to try this option, we suggest using this handy tutorial. Wedding confetti ideas are abundant and can be tailored to pretty much any style, theme, or color scheme. Confetti is a budget-friendly wedding send off idea that will add a festive and colorful element to your departure. One thing we love about confetti is that it comes in all colors and sizes and can be tailored to suit your wedding theme. This is also a wonderful option for the DIY bride as there are a plethora of easy online guides for making your own confetti. We love this easy tissue paper confetti tutorial from Real Simple. Want to make your confetti wedding exit unique? Why not customize your confetti to be heart shaped? If you’re a pilot, why not get some airplane confetti! Motorcycle confetti is available for those of you who spend their free time roaming the open roads. If you’re looking for an eco-friendly option (more eco-friendly ideas below! ), biodegradable confetti is available. If you want to take it a step further, there are also dozens of easy confetti cone tutorials making the internet rounds. Confetti cones are a super cute way to dispense confetti to your guests. Glitter and sequins (or a mix of both!) are affordable options that will work beautifully for an elegant send off that certainly won’t look cheap. The wedding experts at The Knot suggest opting for coarse glitter in small quantities. This will prevent finding glitter stuck in your hair for days on end. Your guests and clean up crew will thank you too! We love the idea of using glitter and sequins for send offs because they make for magical, frame-worthy photos! We can’t get enough of the playful idea of a paper airplane send off for couples trying to stick to a budget. Aside from being a cheap and fun wedding send off idea, paper airplanes also give guests (children and adults alike!) a chance to get creative. We suggest leaving a note on each table with supplies, informing guests of your send off plan. Then your friends and family can tap into their inner-child by working on their airplanes between dances, drinks, and food! To mix it up you can even provide guests with additional supplies like colored paper, glitter, and markers to write fun messages. Have we convinced you to use this super affordable send off option? Don’t forget to designate a point person to pick up and recycle the paper planes after you make your escape! Another cheap wedding exit idea that we simply adore is popcorn. This budget-friendly option is lighthearted and fun, while also doubling as a midnight snack for guests. Let’s just hope they don’t eat it all! To pull off a popcorn send off, all you need is, well, popcorn! Experts suggest sticking to plain kernels and avoiding anything with butter or additives to avoid a sticky mess at the end of the night. The only additional item you may want to spend money on is little baggies or cones to put the popcorn in. However, there are tons of super affordable DIY options that won’t break the bank. 6. Blowing Bubbles Are A Cheap Wedding Exit That Everyone Will Love! Individually packaged jars of bubbles are one of the most popular wedding send off ideas and are also extremely affordable. Having friends and family blow bubbles as you make your exit provides an amazing backdrop for photos and videos. It also gives guests a chance to get playful as they say their farewells! An added bonus of bubbles is that they can easily be personalized for your wedding. Try adding cute tags with your initials, wedding date, or a fun saying on the containers. You can also get a little creative with black and white or bride and groom bubble containers. You can also create a festive display with a cute bubble send off sign. Having your bubble send off at night? A fun idea is to use lighting to illuminate the bubbles flying through the air. Along with the lighting, check out this cool glow in the dark bubble option for your wedding! For a colorful send off, one of our favorite affordable wedding send off ideas is rainbow sprinkles. Sprinkles are both cheap and easy to purchase at any grocery store. And experts say that sprinkles are the perfect size for a toss that will be photographed. They are small enough to not distort photos or block the faces of the happy couple. If you want to try this send off idea at your wedding you can either create baggies or cups of sprinkles to pass out. Have a lot of guests? Create a sprinkle bar where guests can scoop their own sprinkles before your grand exit! As you can see there is no reason to let a tight budget hold you back from a fabulous wedding send off! There are tons of creative, cheap send off ideas out there, that will ensure you have an epic wedding exit to remember for years to come. It’s time to start planning! Modern weddings are notorious for excess. This can be fun in the moment, but result in some practices that are not exactly good for the environment. In response, couples are increasingly testing out new, eco-friendly wedding send off ideas that benefit the earth without lacking in style. Are you trying to make your wedding more sustainable by opting for eco-friendly wedding toss ideas? Read on to learn a little bit more about some of the most loved eco-friendly exit options that won’t harm the earth. 8. Lavender: Who Doesn’t Love The Smell? One of the most romantic, eco-friendly wedding send off ideas that we have seen is a lavender toss. The peaceful scent, earthy texture, and light purple color will add a relaxing and whimsical feel to the final moments of your wedding. To save on disposable packaging, we suggest placing all of the lavender buds in a basket or bowl for guests to grab from. Want to be a bit more organized? Craft individual cones from recycled paper for your guests to grab! How much lavender do you need for a wedding toss? It is recommended to use 1/2 cup of lavender if you are going to be using cones. Going to be setting up a large basket for guests to help themselves? Aim for 1 cup per person to ensure you have enough to go around. For reference, a pound of lavender is roughly equal to 14 cups. This will make about 28 cones or is enough for 14 people if using a large basket. If you are getting married in a grassy outdoor space, we love the idea of incorporating seed bombs into your wedding send off. Seed bombs are little bundles of seeds that grow into abundant fields of wildflowers. There is something special about having guests scatter the beginnings of new life as you make your final exit into a new life together. You can purchase wildflower seed bombs online or you can even make your own with fun DIY guides like this one. If you make some extra, these packets can even double as wedding favors. 10. Plantable Confetti: The Confetti That Sprouts Flowers! Along the same lines, there are also many types of plantable confetti! Traditional confetti is one of the most popular wedding send off options. However, it has become clear that it is simply not a sustainable or environmentally friendly option. A wonderful alternative to conventional confetti, plantable confetti cuts down on waste by embedding tiny seeds into the (biodegradable) paper used. After you toss it, the seeds will take root, boosting the ecosystem and growing into beautiful flowers. Plantable confetti is super cute and comes in a variety of shapes and colors including, of course, hearts. Similarly to seed bombs, we suggest packaging them up in baggies with personalized tags for an added touch of elegance. What could be more poetic than making your grand wedding exit as you are showered with delicate dried flowers? This eco-friendly wedding send off idea provides for a picturesque exit, and can also make for beautiful displays beforehand. Want to try out a dried flower send off at your wedding? Experts suggest allotting around half a cup of dried flowers for each guest. You’ll also need to think about what to hold the petals in. To stay in line with the earth-friendly theme, recycled paper cones are a great option! Brides.com suggests creating cones out of old sheets of music for a lovely vintage feel. Remember the ‘rice killing birds’ myth? Throwing birdseed at weddings didn’t become popular until that myth surfaced. Although this rumor has been proven to be untrue, why not incorporate something that birds will love into your departure? After all, birdseed is the bird-friendly confetti! Since birdseed is biodegradable you can also rest assured that any food the birds don’t eat will break down naturally and possibly even sprout! This makes birdseed one of the best wedding rice alternatives in our opinion, even if the myth was dispelled! Try setting up a birdseed bar where guests can scoop the seeds into the packaging of your choice. It’s a cute idea that will also look great in photos! We also can’t get enough of the playful packaging ideas like these “From the Love Birds” baggies on Etsy. Have you decided to go with a birdseed wedding toss? Experts suggest splurging for higher quality seed to ensure there is less debris or dust mixed in, resulting in a cleaner exit. Another popular eco-friendly wedding send off idea is having guests shower the newlyweds with fresh herbs. This dreamy exit idea is not only good for the earth, but it also smells amazing thanks to the delightful fragrance of fresh cut herbs. Common herbs used for wedding tosses include thyme, sage, mint, and rosemary. All of these choices are easy to find at a local farmers market or grocery store. If you plan far enough ahead, you can even grow them yourself. An added bonus of this idea is that many of these herbs have symbolic meanings, making them a thoughtful way to end your big day. For instance, mint represents virtue and wisdom, while rosemary is a symbol of loyalty. Similar to the birdseed, setting up a stylish bar area for guests to scoop works well. Want the herbs to double as a wedding favor? You can provide cute to-go bags for friends and family to fill. Is it just us, or are these eco-friendly wedding send off ideas extra romantic? No matter what you choose, you can’t go wrong with any of these elegant and timeless wedding toss options. They’ll ensure your grand exit makes a positive impact on the environment! Looking for one-of-a-kind wedding exit ideas that aren’t the typical rice, bubbles, or confetti? If you just don’t feel that any of the classic wedding departure ideas are a fit for your special day, we have done the research for you and compiled a list of creative wedding exits that will make your wedding departure totally your own. One of the most unique wedding send off ideas that we have witnessed is a butterfly release. This creative idea makes for a magical getaway, not to mention out-of-this-world photos. Releasing butterflies at the end of a wedding is symbolic of new beginnings as well a happiness. And we can’t think of a better way to say farewell to your guests! The wedding planning experts at Brides.com suggest entrusting the responsibility of the release to a few trusted friends and family members. This will ensure that the epic moment goes off without a hitch. They also recommend doing your research and sticking with a company that guarantees the butterflies are treated in a safe manner. It doesn’t get more unique than leaving your wedding surrounded by fluttering butterflies. Another cool wedding send off idea is having guests ring bells as you make your departure. According to ancient Irish tradition, church wedding bells were rung during weddings to ward off evil spirits. There were also a way to spread the word to neighboring communities that a wedding had taken place. In more modern tradition, wedding bells are also thought to be a reminder of the wedding vows. No matter what you believe about bells, we think they are a festive addition to any wedding send off. There are also a ton of unique ideas for incorporating bells into a wedding send off. For an old-style wedding, you can include antique bells for guests to ring (which also double as a one-of-a-kind favor). Other great ideas include creating bell wands for guests to wave, and even handing out bicycle bells for an extra quirky get away. Smoke bombs are perfect for the couple with a flair for the dramatic. Incorporating colorful smoke bombs into your departure will make a lasting impression on your guests. This hot wedding trend not only makes a statement, but it also looks absolutely incredible in photos. If you decide to try this daring exit idea, it is best to use colors that match your bridesmaid’s dresses and overall wedding color palette. Some couples like to set off the smoke bombs themselves (which as you can see looks amazing in photos). We suggest having them set off a bit away from the crowd in an outdoor space so that you are not overwhelmed with heavy smoke. This will help prevent the smoke from damaging clothing. 17. Have A Beach Ball Exit Party! Planning an outdoor wedding this summer? If so, beach balls are a fresh and fun idea to incorporate into your wedding exit — be it from the ceremony or from the reception. This playful trend will keep your exit lighthearted while also adding an awesome pop of color to your send of photos! Looking to incorporate beach balls into your ceremony? Bride Box suggests leaving inflatable mini beach balls on each seat with instructions on the program for guests to blow up and toss during your recessional. This is ideal for adding a laidback touch to an informal, outdoor wedding. But what if you decide to wait until the end of your reception for send off? You can leave mini beach balls in large tubs or buckets throughout your reception area with send off instructions. An added bonus of this idea is that the beach balls can also double as a wedding memento for guests to take with them. Having guests cheer and wave pom poms as you make your grand exit is a fun alternative to more traditional send off options. This unique wedding send off idea is perfect for couples that met during college and want to give a nod to their alma mater. It is also just a fun idea for any sports obsessed couple that wants to incorporate their favorite team into their wedding day. Bride and groom rooting for different schools or teams? Why not settle your rivalry once and for all? During your departure, provide guests with pom poms in the colors of both teams and let them choose sides! Have your guests make some noise with percussion instruments for an unforgettable exit from your ceremony or reception! This playful idea works well for casual, outdoor weddings in the warmer months. Two of our favorite options include tambourines and maracas! You can even add a personalized monogram, making these a keepsake to send home with guests. If you want to lighten up your ceremony, incorporate some noise! Place tambourines on the chairs of guests and instructions to wave them during your recessional. Saving up for a grand exit at the end of the night? Place maracas on tables for guests to shake as you make your escape at the end of your reception. If you are like us, you probably agree that sparklers for your wedding send off cannot be topped. In our opinion, using sparklers for your wedding send off is one of the most beloved and grand wedding exit ideas due to their elegance and beauty. However, there are a ton of ways to make a sparkler send off unique to your wedding. Creating personalized labels and matches to go with your sparklers, which also makes for a super cute display at your reception. Having your bridal party draw with the sparklers to create glowing hearts, spell out L-O-V-E, or even write your wedding date. The only checklist you need to plan the perfect wedding. Get yours today for free. We may be biased, but there is something magical about a nighttime wedding exit. Dark night skies set the perfect backdrop for a breathtaking departure. This setting could be illuminated with candles, sparklers, glow sticks — and even fireworks. Get ready to light up the night sky for a final farewell to your friends and family with these ethereal night time wedding send off ideas. One of the most breathtaking send off ideas for a nighttime wedding is having guests illuminate the sky by releasing delicate Chinese lanterns. Used for ceremonial purposes for centuries throughout Asia, these beautiful lanterns will create an absolutely stunning send off. If you decide to try out a lantern release as you exit your wedding, plan to give each family or individual a lantern. Be sure to include instructions on how to execute the release! To make the send off extra meaningful, you may also want to have friends and family affix well wishes to the lanterns. Looking to personalize the send off even more? You can give each guest a lighter monogrammed with your initials or wedding date as a memento of your wedding celebration. 22. Glow Sticks: Fun For Everyone! For a wedding reception that lasts well into the night, you cannot beat a glow stick wedding send off. One of the more playful options for a nighttime wedding send off, having the chance to play with glow sticks will delight both children and adults! While not as bright, they make for a more colorful alternative to sparklers at your wedding. For any Star Wars obsessed couples, we also love the idea of using glow-in-the-dark lightsabers. When executing a glow stick send off, wedding planners suggest letting guests break the glow sticks themselves right before you make your exit. However, these glow sticks stay super bright for hours. If you don’t have a designated person to pass out the glow sticks, try creating a fun display with a “Let Love Glow” sign instructing guests of your departure plans. Oh, and don’t forget to take pictures — they are going to look amazing! Pro Tip: Looking for a thicker light? Try these super fun LED foam sticks! Balloons are an important part of so many of life’s big celebrations and milestones. Birthday parties, anniversaries, welcome home parties, congratulations, and even Valentine’s Day are just a few that use them. So why should you miss out on these party mainstays just because you are having an evening wedding? We are all familiar with the classic white balloon release used in many daytime wedding exits. But, the idea of balloons often gets overlooked when it comes to night time wedding send off ideas. You can now purchase LED balloons for your wedding send off. Regular balloons with LEDs inside of them, these make a festive addition to any night time wedding. If opting for a balloon send off, we ask that you dispose of balloons properly. Sending balloons off into the sky might sound like a fun and worry-free way to dispose of these balloons, but they can be very harmful to wildlife wherever they land. To have a responsible send off with LED balloons, you’ll need to attach a weight to each balloon to ensure they do not fly off. When the send off is over, designate someone to pop the balloons and dispose of all the latex from the balloons. If you are looking for a dramatic night time wedding send off idea and are not worried about sticking to a specific budget, you may want to consider incorporating a firework show into your departure. This popular wedding trend will ensure you have a fairytale end to your perfect day (as well as epic photos to back it up). When planning a firework wedding exit, it is important to research local and state laws. You will also want to get any necessary permits or insurance beforehand. Since you will literally be playing with fire, make sure that you consult with experts. Be sure to choose a safe backdrop for your display (e.g. best to execute over an open field versus a heavily wooded area). A firework display at the end of your big day may is jaw-dropping. But sparklers have a similar effect while allowing friends and family to actively participate in your night time wedding send off. This classic night time send off idea never goes out of style, creating a festive and exciting mood for your departure. The perfect sparkler send off is all about timing, with two key elements involved. The first item to keep in mind when it comes to timing is setting a specific time for your sparkler departure and notifying guests. This will ensure that you have a nice sized crowd to see you off at the end of the night. There are a ton of cute sparkler display options that you can use to let guests know when to be ready to bid you adieu. The second essential element of any sparkler send off is timing your actual exit to take place while the sparklers are lit. To determine the ideal timing, you may want to test out your sparklers beforehand. See how long they burn and then choose a point person to coordinate the day of. The longer the wedding sparklers, the better! Use this how-to guide for executing the perfect sparkler send off to make sure your send off is perfect! One of the best things about weddings is the unique traditions that vary from culture to culture. Whether you are looking for wedding send off ideas or just want to learn a little bit more about how weddings are celebrated around the world, here are a few traditional bride and groom departure ideas commonly seen at weddings in other countries. Dating back to the ancient Roman tradition, the French opt for showering the bride and groom with wheat as they depart their reception. Similarly to the tradition of rice used in the United States, tossing wheat is a symbol of bounty and prosperity. Want to incorporate a touch of Italy into your wedding send off? A popular Italian wedding tradition is to toss sweet candies and sugared nuts at the newlyweds as they make their escape to symbolize the sweetness of marriage. As the bride and groom exit their village following their wedding, it is a Kenyan tradition for the father of the bride to spit on the bride’s chest and head so that he will not jinx their good luck. At the end of weddings on the French Polynesian Marquesa Islands, it is traditional for the bride’s family to lay down next to each other side by side for the bride and groom to walk over as they exit! A tradition sometimes seen in wedding send offs in the United States, it is traditional for newlyweds in the Philippines to release two doves during their reception, a representation of a long and harmonious life of wedded bliss. The opposite of a grand wedding exit is a popular tradition in Venezuela, with the bride and groom typically trying to sneak out of the reception without anyone noticing. The guests are on high alert, as it is considered to be good luck if you are the first guest to realize that the newlyweds have departed. Now that you’ve seen what’s out there, it’s time to make a decision. What send off will you choose? If you’re stuck deciding, try some of the tips below to pick the best choice for you! The first tip for choosing a send off is to consult with your venue about any restrictions. A lot of venues have restrictions in place, so it’s best to check with them. If a venue has restrictions it is most likely any send off that is hard to clean up, flammable, or not suited for indoor use (if no outdoor walkway is available). Give your venue a call first to see what they do and don’t allow so you don’t end up purchasing a send off you can’t use! On top of venue restrictions, there may be local and/or state laws that have additional restrictions. While your venue should be on top of this, that is not always the case. And if you have a home wedding that will be on you to find out. The restrictions are usually for send offs that are flammable (fireworks, sparklers, etc.) or those that are essentially organized littering (improperly using LED balloons, wedding lanterns, etc.). Double-check to make sure you can use the send off of your choice! How Easy Can You Clean Up After The Send Off? Your send off is the last thing on the list of your wedding day, and someone is going to have to stay to take care of the mess. If your venue includes this, then don’t worry. However, don’t expect guests to become the cleaning crew once the fun is over. Most likely everyone will be on their way back to their hotels. If your party is in charge of the cleaning, maybe stick with something a little easier to clean. Pick The Perfect Send Off! With these tips in mind, you should be able to narrow down your search to the perfect send off. Choosing a send off is the first step. You’ve got all the materials you need for all of your guests to participate. Here are some general tips for helping you coordinate your wedding send off. Although you will most likely go over the send off a million times before it actually happens, it helps to physically prepare before the real thing. When you get your products, double-check you have enough, check for any that need to be replaced, and order more if necessary. Once that is done, make sure that the products are assembled (if necessary) so that each guest can easily grab what they need. It’s super easy to set the boxes aside and forget about them. Make sure you have everything you need to make things go smoothly on your wedding day. Once you’ve got everything packaged individually for each guest, it’s time to set up the area where your exit will be taking place. This will be a little different for each send off, but some basics all need to be in place. This may sound ridiculous for those of you with safer send offs, but don’t underestimate the power of alcohol. Sparklers will have the leftover steel rod and should be placed in a bucket of water or sand to cool off. Other items such as glow sticks, pom poms, and the like can just go in normal trash cans. Have a couple disposal bins at the ready for guests to throw everything away to make cleanup easier. This, of course, doesn’t apply to those who are using eco-friendly methods such as birdseed or lavender, or anything that can remain on the ground. Ideally, you’ll want to meet with your photographer beforehand to discuss what poses you’d like to have and how many poses total you’ll want/can take. But you’ll also work out the positioning. Sometimes (especially if your exit is at night) there is ambient lighting affecting the shot. Your send off choice will affect what type of lighting is needed. And sometimes there will be things that just make certain shots really difficult. Working out the positioning will allow you to develop a solid plan for beautiful photos. There are so many cool things you can do with your send off options. And you only have this opportunity for the duration of your wedding, so you might as well show off what you have! A display table can be as simple or as complex as you’d like. For those with sparklers, a ‘let love sparkle’ sign would be cute. If LED balloons or glow sticks were your choice a ‘let love shine’ or ‘let love glow’ sign would work. You can individually wrap your send off items and give them with tags attached, instructions on how to be a part of the send off, or simple thank you notes. Throw all of the items into a beautiful display bucket to complete the look. If you’re doing a sparkler send off, you can get everything you need for a display table here. For other send offs, Pintest is a great place to look for ideas. Simply head over there and type in [your send off] display table (i.e glow stick send off display table, sky lantern send off display table, etc). Who better to announce the time of your send off then the band or DJ? They already have a microphone in place! Coordinate with them on what time they should announce the last song, and let them know to mention where you will be meeting following the end of that song for the send off. Now Go Plan Your Perfect Wedding Send Off! A wedding send off is a wonderful opportunity for friends and family to gather around a newly wedded couple, showering them with good wishes for years of wedded bliss, and no wedding would be complete without a special departure. Whether you are planning an over-the-top wedding exit to rival the Macy’s Day Parade, or a low-key send off with your closest friends and family gathered near, a wedding send off is the perfect way to enter into your new life as man and wife.